Many of us have been lucky not to have lived through a World War; but most of us would have heard stories from our parents, grandparents or others of not just the horrors on the battlefront, but also the impact far from those killing fields. Some of that impact related to consumption. During both World Wars, governments displayed posters urging citizens to conserve fuel, food and other commodities for the war effort. 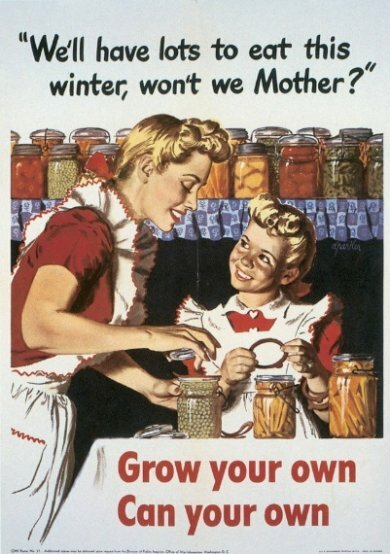 Victory gardens were promoted and helped feed populations in the UK, USA, Australia and many other countries. From what I understand, those posters were quite effective. Maybe that style of poster needs to be brought back again (just without the sexism and us vs. them angle). Environmental messages are great and appeal so some, but so too is tapping into patriotism and other aspects of what it is to be human; which resonates with others. We are at war right now – not just in places where we perhaps shouldn’t be (and in part over resources that are contributing to our undoing), but also with ourselves in terms of the damage we’re doing to our planet from the comfort of our homes, workplaces and elsewhere. A war-scale effort is required to turn things around; otherwise the result will be very much like the damage done by all the bombs dropped and bullets fired during armed conflicts. Lloyd Alter from TreeHugger has been running a series of galleries of war-era posters that I’ve found fascinating. They feature simple but powerful and motivating messages.